Collection consists of: 1. Two photographic albums of original prints and a small album with a short selection of prints (mainly duplicates from the other two); 2. Two negative albums (empty, negatives removed and placed in five envelopes) with original descriptions (in Polish); 3. Three envelopes of loose original prints of - the Polish Army in Soviet Union (duplicates from album No. 1), the Polish Air Force in Britain (mostly images of Leon Grzywna during his service with the PAF), and one of the tank regiments of the 1st Polish Armoured Division, also in Britain; 4. Envelope of Leon Grzywna's (and his son, Adam) post-war family photographs and correspondence (letters and postcards); Non-photographic material: 5. Leon Grzywna's wartime manuscript personal diary, in Polish (passed over to the Documents Section); 6. Leon Grzywna's British campaign medals - Defence Medal and War Medal 1939-1945 (passed over to the Exhibits Section); 7. Wallet with prewar Polish banknotes (80 Polish zlotys), coins - prewar Polish, postwar Polish, Nazi and Soviet (all in separate envelopes); Leon Grzywna's Lieutenant's insignia and uniforms buttons; wrist watch and rosary (passed over to the Exhibits Section). ALBUMS WITH PRINTS They were created by Leon Grzywna as a merchandise catalogue of his images for sale to his fellow soldiers. Album No. 2 contains a short note in Polish how to order images with all relevant information about payment, delivery etc. Each photograph has a number allocated and a short description, usually with an exact date. ALBUM No. 1: TATISHCHEVO, RUSSIA (SOVIET UNION) Images no. 11-12 - Horse-drawn transport of 13 Infantry Regiment (5th "Wilno" Infantry Division) on the way to collect building material for their accommodation dugouts; Tatishchevo, 15 October 1941. Image no. 13 - Horse-drawn transport of 13 Infantry Regiment on the way to collect building material for their accommodation dugouts. Second Lieutenant Leon Grzywna, the CO of the transport column, is on the left; Tatishchevo, 15 October 1941. Images 14-15 - Troops of 13 Infantry Regiment cutting trees in the forest for their accommodation dugouts; Tatishchevo, 15 October 1941. Image 16 - Troops of the 13th Infantry Regiment eating potatoes roasted in a camp fire, according to an original caption the main food of the lumberjack/forest parties; Tatishchevo, 15 October 1941. Image 22 - Horse-drawn transport column of 13 Infantry Regiment on the way in the area of Tatishchevo; 15 October 1941. Image 24 - First rifle practice in the 2nd Machine Gun Company of the 13th Infantry Regiment. The soldier shooting a rifle in the background is Lieutenant Gajęcki, the CO of the Company; Tatishchevo, 27 October 1941 (HU 69858). Image 25 - First rifle practice in the 2nd Machine Gun Company of the 13th Infantry Regiment. Russian PM M1910 heavy machine gun used by the Company; Tatishchevo, 27 October 1941 Image 26 - First rifle practice in the 2nd Machine Gun Company of the 13th Infantry Regiment. Colonel Kramczyński, the Deputy CO of the Regiment (second from the left), observing troops during the training (HU 69859). Image 33 - General Władysław Anders taking salute from the Guard of Honour of the 13th Regiment during his first inspection of the 5th Infantry Division. Note a military band present. Other officers present are: Colonel Nikodem Sulik, the CO of the 13th Regiment (first from the left); Lieutenant Colonel Kramczyński, the Deputy CO of the Regiment (middle left); Captain Ziobrowski, the Adjutant of the Division (in a civilian outfit); General Mieczysław Boruta-Spiechowicz, the Commander of the Division (between musicians); Tatishchevo, 26 October 1941 (HU 70580). Image 34 - General Mieczysław Boruta-Spiechowicz, Colonel Nikodem Sulik and General Władysław Anders during the inspection of 13th Regiment; Tatishchevo, 26 October 1941 (HU 70581). Image 36 - General Władysław Anders, Colonel Nikodem Sulik with one of the soldiers of the 13th Regiment, dressed in the WW1 era uniform provided by the Soviets; Tatishchevo, 26 October 1941 (HU 70579). Image 42 - General Władysław Anders examining a field kitchen of the 5th Division; Tatishchevo, 26 October 1941. Images 43-54 - First public performance of the 13th Regiment band; Tatishchevo, 26 October 1941. Image 56 - General Władysław Anders receiving raport from Major Stoczkowski, the CO of the 2nd Battalion, 13th Infantry Regiment; Tatishchevo, 26 October 1941; Image 64 - Troops of the 2nd Machine Gun Company of the 13th Regiment getting accustomed to Soviet weaponry; Tatishchevo, September 1941. Image 66 - Officers of the 2nd Machine Gun Company of the 13th Regiment. Left to right - 2nd Lt. Sinkiewicz; 2nd Lt. Glezer; 2nd Lt. Olechniewicz; Lt. Gajęcki (CO); 2nd Lt. Leon Grzywna; Tatishchevo, September 1941. Image 71 - General Mieczysław Boruta-Spiechowicz (far right) and Colonel Zygmunt Berling, the Chief of Staff of the 5th Division (in civilian cloths), on the way to participate in the Holy Mass for the Division; Tatishchevo, 5 October 1941. Image 72 - General Mieczysław Boruta-Spiechowicz (middle) and Colonel Zygmunt Berling (in civilian cloths), taking part in the Holy Mass for the Division; Tatishchevo, 5 October 1941. Image 73 - Group of Polish female refugees attending the Holy Mass for the 5th Division; Tatishchevo, 5 October 1941. Image 74 - 40 mm Bofors anti-aircraft gun by the altar during the Holy Mass for the 5th Division; Tatishchevo, 5 October 1941 (HU 69856). Image 75 - Military choir singing "Gaude Mater Polonia" song during the Holy Mass for the 5th Division; Tatishchevo, 5 October 1941. Image 76 - The Holy Mass for the 5th Division; Tatishchevo, 5 October 1941. Note a 40 mm Bofors anti-aircraft gun on the right. Image 82 - Russian woman kneeling in front of the Bofors gun during the Holy Mass for the 5th Division; Tatishchevo, 5 October 1941. Image 83 - General Mieczysław Boruta-Spiechowicz during the Holy Mass for the 5th Division. The officer in black civilian suit is Colonel Zygmunt Berling; Tatishchevo, 5 October 1941. Image 84 - General Mieczysław Boruta-Spiechowicz amongst officers of the 5th Division; Tatishchevo, 5 October 1941. Image 85 - The Holy Mass for the 5th Division; Tatishchevo, 5 October 1941. Note a 40 mm Bofors anti-aircraft gun on the right. Image 91 - General Mieczysław Boruta-Spiechowicz addressing officers of the 5th Division; Tatishchevo, 5 October 1941. Image 92 - General Mieczysław Boruta-Spiechowicz amongst officers of the 5th Division; Tatishchevo, 5 October 1941 (HU 69861). Image 93 - Colonel Jerzy Grobicki, the Deputy Commander of the 5th "Wilno" Division, leading the first divisional parade; Tatishchevo, 5 October 1941. Image 94 - 13th Infantry Regiment marching past during the first parade of the 5th Division; Tatishchevo, 5 October 1941 (HU 69857). Image 95 - 13th Infantry Regiment marching past during the first parade of the 5th Division; Tatishchevo, 5 October 1941 (HU 69855 & HU 69860). Image 96 - General Mieczysław Boruta-Spiechowicz (in the background, saluting) and Colonel Zygmunt Berling (in a dark civilian suit) receiving the 5th Division parade; Tatishchevo, 5 October 1941 (HU 69854). Image 101 - Horse-drawn signals units of the 5th Division taking part in the first divisional parade; Tatishchevo, 5 October 1941. Image 103 - Horse-drawn artillery units of the 5th Division taking part in the first divisional parade; Tatishchevo, 5 October 1941. Image 104 - Officers of the 2nd Machine Gun Company of the 13th Regiment outside their tent. Left to right - Lt. Gajęcki (CO); 2nd Lt. Glezer; 2nd Lt. Olechniewicz; Tatishchevo, October 1941. Image 105 - Tents of 2nd Machine Gun Company of the 13th Regiment; Tatishchevo, November 1941. Image 113 - Altar prepared for celebrations for the Polish Independence Day; Tatishchevo, 11 November 1941. Image 114 - Celebrations for the Polish Independence Day, General Boruta Spiechowicz saluting the Polish National Flag; Tatishchevo, 11 November 1941. Image 125 - 2nd Machine Gun Company of the 13th Regiment at the Holy Mass during the Polish Independence Day celebrations; Tatishchevo, 11 November 1941. Image 131 - Officers outside the Officers Cassino of the 5th Division; Tatishchevo, November 1941. KERMINE, UZBEKISTAN (SOVIET UNION) Sequence of photographs about evacuation of the Airmen and Sailors Company, probably with troops of other non-infantry units, separated from the main body of the 5th "Wilno" Infantry Division and sent to Britain (through Kazakhstan, Uzbekistan, Persia, and India). Image 165 - Officers of the Airmen and Sailors Company; 2nd Lt. Leon Grzywna is on the left; Kermine, 9 February 1942. Image 171 - On the way to Kermine through Kazakhstan with a company of pilots; 4 February 1942, Kazakhstan. Image 172 - Soviet female workers passing by a train of Polish troops; 4 February 1942, Kazakhstan. Image 173 - On the way to Kermine through Kazakhstan. One of the servicemen present is 2nd Lt. Bronisław Bryła; 4 February 1942, Kazakhstan. Image 175 - Servicemen of the Airmen and Sailors Company in conversation with Kazakhs; 4 February 1942, Kazakhstan. Image 191 - Servicemen of the Airmen and Sailors Company by one of the Kazakh towns; February 1942, Kazakhstan. Image 192 - One of the Kazakh towns; February 1942, Kazakhstan. Image 193 - Two emaciated Poles (and their equally emaciated dog), who spent two years in Siberian captivity, met by the troops in the train station in the town of Arisa (? ), possibly Kazakhstan; 7 February 1942. Image 194 - Monument of Lenin and Stalin outside train station in Arisa (? ), possibly Kazakhstan; 7 February 1942. Image 201 - Unidentified Polish Air Force serviceman on a donkey; Kermine, 9 February 1942. Image 202 - Servicemen of the Airmen and Sailors Company building their new camp at Kermine; 9 February 1942. Image 203 - Servicemen of the Airmen and Sailors Company building their new camp at Kermine; 9 February 1942. Image 205 - Horse-drawn wagon of building material for airmen's camp; Kermine, 9 February 1942. Image 206 - Group of officers of the Airmen and Sailors Company. Left to right - Cpt. Rybicki; 2nd Lt. Radecki; 2nd Lt. Bronisław Bryła; Chaplain Józef Król; Warrant Officer Walenty Chwalik; 2nd Lt. Piotr Król; Officer Cadet Zdzisław Kołodziej; Kermine, 9 February 1942. Image 211 - Camel-drawn Uzbek wagons; Kermine, 9 February 1942. Image 212 - Group of NCOs and officers of the Airmen and Sailors Companys. Seated, left to right - Sgt. Kokotko; Sgt. Kordel; 2nd Lt. Grębecki; Warrant Officer Walenty Chwalik; 2nd Lt. Piotr Król; Kermine, 9 February 1942. Image 213 - Group of officers of the Airmen and Sailors Company having a meal while standing outdoors. Left to right - Officer Cadet Zdzisław Kołodziej; 2nd Lt. Leon Grzywna; Officer Cadet Władysław Furtek; 2nd Lt. Piotr Król; Kermine, 9 February 1942. Image 214 - Two unidentified officers of the Airmen and Sailors Company having a meal while standing outdoors; Kermine, 9 February 1942. Image 215 - Group of servicemen of the Airmen and Sailors Company having a meal while standing outdoors; Kermine, 9 February 1942. Image 216 - One of the servicemen with local women and children dressed in their traditional costumes; Kermine, 9 February 1942. Image 221 - Group of Uzbek street traders with their goods; Kermine, February 1942. Image 223 - Two servicemen of the Airmen and Sailors Company with a donkey; Kermine, 9 February 1942. Image 224 - Two servicemen of the Airmen and Sailors Company with a donkey; Kermine, 9 February 1942. Image 225 - Group of servicemen of the Airmen and Sailors Company with donkeys; Kermine, 9 February 1942. Image 226 - Camel-drawn Uzbek wagons; Kermine, 9 February 1942. Image 231 - Servicemen of the Airmen and Sailors Company receiving their rations at the field kitchen. Left to right - LCpl. Rabiczko; LCpl. Mikołaj Paliński; 2nd Lt. Kristiani (of Estonian origin); Lt. Suzi; 2nd Lt. Liblikma; Lt. Ott; Kermine, 9 February 1942. Image 232 - Servicemen of the Airmen and Sailors Company. Left to right - WO Walenty Chwalik; Chaplain Józef Król; 2nd Lt. Piotr Król; area of the No. 1 Flight (Aerial Squadron), Kermine, 9 February 1942. Image 233 - Brothers Chaplain Józef Król and 2nd Lt. Piotr Król; area of the No. 1 Flight (Aerial Squadron), Kermine, 9 February 1942. Image 234 - Major Górski, the CO of the Aerial Squadron, with Cpt. Aleksandrow and Lt. Panek; Kermine, 9 February 1942. Image 235 - 2nd Lt. Piotr Król, Chaplain Józef Król and other officers outside the Assembly Station of the Polish Air Force and Navy HQ building; Kermine, February 1942. Image 236 - Uzbek food being prepared; Kermine, March 1942. Images 241 - 245 - Servicemen of the Airmen and Sailors Company in a railway carriage on the way to Kermine; probably Kazakhstan, February 1942. Image 246 - 2nd Lt. Piotr Król and Cadet Officer Furtek on the way to Kermine; probably Kazakhstan, February 1942. Images 281 - 282 - Camp newspaper "Huragan" (Hurricane), first edition, at Kermine; March 1942. Image 283 - 2nd Lts Piotr Król and Grębecki reading the newspaper; Kermine, March 1942. Image 284 - 2nd Lt. Leon Grzywna, the Intelligence/Educational Officer of the Assembly Station of the Polish Air Force, reading the newspaper; Kermine, March 1942. Image 285 - General view of the airmen camp at Kermine, March 1942. Image 286 - Uzbeks with their camels; Kermine, March 1942. Image 291 - Camel-drawn Uzbek wagon; Kermine, March 1942. Images 321 - 326 - Concert of the airmen company choir during the oath taking ceremony (321 - Cadet Officer Władysław Furtek recites; 323 - Volunteer J. Królikowski recites); Kermine, March 1942. Images 331 - 334 - The oath taking ceremony of the airmen; Kermine, March 1942. Image 341 - Uzbeks transporting cotton on their camels; Kermine, March 1942. Images 342 - 344 - Airmen choir practice in the desert, including one female member; Kermine, March 1942. Image 345 - Two female servicemen with their male colleague; Kermine, March 1942. Images 346 and 351 - Soldiers and Polish civilian refugees at the Holy Mass; Kermine, March 1942. Image 355 - Military parade at Kermine. The band belongs to the 7th Infantry Division; March 1942. Image 354 - Female volunteers of the Airmen and Sailors Company marching past during the military parade. The band belongs to the 7th Infantry Division; Kermine, March 1942. Image 356 - Cadet Officer Władysław Furtek reciting during the oath taking ceremony; Kermine, March 1942. Image 361 - Airmen at the Holy Mass; Kermine, March 1942. Image 394 - Female workers of the airmen's club on the train ready to leave Kermine for Krasnovodsk (today Turkmenbashi, Turkmenistan). Left to right - Volunteer Irena Baranowska; Colonel Prokop; unknown; unknown; 22 March 1942. Image 395 - Original caption reads - Estonian train carriage in the south of Russia ?. Evacuation of Polish units from Kermine to Krasnovodsk; 22 March 1942. Image 396 - Group of officers on the day of the evacuation of Polish units from Kermine to Krasnovodsk. Left to right - unknown; unknown; Lt. Styrski; 2nd Lt. Fara; 22 March 1942. Image 401 - Portrait of Sergeant Pieczyński; Kermine, February 1942. Image 402 - Portrait of unnamed Corporal; Kermine, February 1942. Image 403 - Cadet Officers Zdzisław Kołodziej and Władysław Furtek with their belongings ready to leave Kermine for Krasnovodsk; 22 March 1942. Image 405 - Two airmen and a donkey. Sergeant Kokotko on the right; Kermine, 9 February 1942. Image 406 - Crowd of Polish soldiers and civilians ready to leave Kermine for Krasnovodsk; 22 March 1942. Original caption reads - "The happiest hour in Russia". Image 411 - 2nd Lts Piotr Król, Spittal (?) and Bronisław Bryła ready to leave Kermine for Krasnovodsk; 22 March 1942. Image 412 - Crowd of Polish soldiers ready to leave Kermine for Krasnovodsk; 22 March 1942. Image 413 - Colonel Prokop (probably), the Chief of Staff of the 7th Infantry Division, says farewell to the Airmen and Sailors Company before their evacuation to Krasnovodsk; Kermine, 22 March 1942. Image 414 - Servicemen of the Airmen and Sailors Company with a Kazakh local (?) on their route to Kermine; February 1942. Image 415 - Local Kazakhs (?) at the station in the town of Dushak; February 1942. PAHLEVI AND TEHERAN, PERSIA Images 416 and 421- Servicemen of the Airmen and Sailors Company travelling from Krasnovodsk, Soviet Union (today Turkmenbashi, Turkmenistan) to Pahlevi, Persia (today Bandar-e Anzali, Iran) on board a Soviet ship; 25 March 1942. Image 425 - Servicemen of the Airmen and Sailors Company at Pahlevi before moving to Teheran; 26 March 1942. Image 426 - 2nd Lt. Piotr Król eating a sandwich at Pahlevi before moving to Teheran; 26 March 1942. Image 432 - Volunteer Wanda Faliszewska and Cadet Officer Władysław Furtek at Pahlevi; 26 March 1942. Image 433 - Photograph missing, Pahlevi. Image 434 - Volunteer Wanda Faliszewska and Master Corporal Zieniewicz (?) at Pahlevi; 26 March 1942. Image 435 - 442 - Photographs missing, Pahlevi. Image 443 - Park at Pahlevi; 26 March 1942. Images 444-445 - Column of lorries with Polish servicemen on the way to Teheran from Pahlevi; 27 March 1942. Image 451 - Polish servicemen with local Persians at Pahlevi; 26 March 1942. Image 453 - Local Persians at Pahlevi; 26 March 1942. Images 454-456 - Lorries with Polish servicemen on the way to Teheran from Pahlevi; 27 March 1942. Images 462-463 - Polish servicemen at Pahlevi; 26 March 1942. Image 464 - Crowd of Polish servicemen by the column of lorries at Pahlevi; 26 March 1942. Image 465 - View of the entrance to park at Pahlevi; 26 March 1942. Images 471-474 - Column of lorries with Polish servicemen on the way to Teheran from Pahlevi; 27 March 1942 (image 473 is HU 69864 and 474 is HU 69865). Image 475 - Polish servicemen at Qazvin, Persia during a break in the journey; 28 March 1942. Image 476 - Polish servicemen departing from Qazvin; 28 March 1942. Images 481-494 - Column of lorries with Polish servicemen on the way to Teheran from Pahlevi; 27 and 28 March 1942. Images 501-506 and 516-526 - Archbishop Józef Gawlina paying a visit to Polish airmen at Teheran; 29 March 1942. Image 511 - On the Persian road; 27 March 1942. Images 531-532 - Rabbi amongst officers of the Airmen Company; possibly Captain Rabbi Mejer Steinberg; Teheran, 29 March 1942. Image 533 - Column of lorries with Polish servicemen on the way to Teheran from Pahlevi; 27 March 1942 (HU 69866). Image 534 - Column of lorries with Polish servicemen on the way to Teheran from Pahlevi; 27 March 1942. Image 535 - General view of the airmen camp at Teheran; 29 March 1942. Image 536 - Small group of Polish servicemen - unnamed two men, a woman and a boy; Teheran, 29 March 1942. BOMBAY, INDIA AND CAPE TOWN, SOUTH AFRICA Images 541-542 - Indian traders with their fares approaching troopship SS City of Canterbury in a boat in Bombay; 22 April 1942. Image 544 - Photograph missing. Bombay, 22 April 1942. Image 546 - Masses of Polish servicemen on board troopship SS City of Canterbury in Bombay; 22 April 1942. Images 551-556 - Various sites in Bombay; 23 April 1942. Image 561 - Column of Polish airmen marching through streets of Bombay; 23 April 1942 (HU 69867). Images 562-566 - Polish airmen in various places in Bombay; 23 April 1942. Image 572 - Polish airmen having a swim in the Indian Ocean; Bombay, 23 April 1942. Image 574 - Indian traders with their fares approaching troopship SS City of Canterbury in a boat in Bombay; 22 April 1942. Images 576 and 583 - Troopship SS City of Canterbury approaching Bombay; 22 April 1942. Image 591 - Polish servicemen on sightseeing trip in Bombay; Bombay; 23 April 1942. Image 593 - Indian women at work; Bombay; 23 April 1942 (photograph missing). Image 603 - Polish servicemen on board troopship SS Avatea sailing by the Cape of Good Hope, South Africa; 6 April 1942. Images 614-634 - Polish officers in Cape Town, South Africa; 7, 8 and 11 April 1942. Image 625 - Polish officers in Cape Town park. Left to right - 2nd Lts Kristiani and Piotr Król; WO Walenty Chwalik; Lts Siekierski, Fara, Kowalewski; 11 April 1942. Images 645-646 - Polish servicemen in Kirkcaldy, Scotland; 7 June 1942. Images 652-654 - Views of Bombay taken from troopship SS Awatea; 22 April 1942. Image 656 - Building in Bombay; 22 April 1942. ALBUM No. 2 Album contains images from various stages of Leon Grzywna's journey from Soviet Union to Britain; they are not in chronological or numerical order. Image 2013 - Two Polish servicemen in Buzuluk; January 1942. Image 2041 - Unnamed Polish airman in front of Shah Reza Pahlavi's monument in Teheran; 31 March 1942. Image 2044 - Polish airmen on the way to Ahwaz from Teheran; 31 March 1942. Image 2045 - Persian labourers at work on the side of the Ahwaz-Teheran railway line; 2 April 1942. Image 2046 - Two young Polish boys (in uniform) playing with a donkey during a journey to Ahwaz from Teheran; 2 April 1942. Images 2051-2056 - Airmen of No. 1 Flight (Aerial Squadron) marching to the railway station; Teheran, 1 April 1942. Images 2061-2062 - Scenes in Bomaby; 22 April 1942. Images 2063-2066 - Scenes on board troopship SS Awatea sailing across Atlantic; May 1942. Image 2071 - Officers of the Airmen and Sailors Company in the camp of the 5th "Wilno" Infantry Division at Koltubanka, Russia (Soviet Union). Left to right - Officer Cadet Władysław Furtek, Chaplain Józef Król and his brother 2nd Lt. Piotr Król; January 1942. Images 2072-2102 - Sequence of images of Polish airmen in the camp of the 5th "Wilno" Infantry Division in Koltubanka; January 1942. Image 2103 - Snowman build by servicemen of the Jewish camp in Koltubanka; January 1942. Images 2104 - Airmen of No. 1 Flight (Aerial Squadron) in their camp in Koltubanka; January 1942. 2nd Lt. Leon Grzywna is on the left. Images 2105-2106 - Airmen of No. 1 Flight (Aerial Squadron) in their camp in Koltubanka; January 1942. Images 2112-2114 - 2nd Lt. Kowalewski in the park at Kirkcaldy; June 1942. Images 2121-2124 - Scenes in Bombay, airmen of No. 1 Flight (Aerial Squadron) marching through the city; 23 April 1942. Images 2131-2134 - Polish airmen in the park at Cape Town; 8 May 1942. Image 2135 - Polish airmen trading for food with local women on the way from Koltubanka to Kermine; early February 1942 (the same image as MH 1855). Image 2136 - Polish airmen trading for food with local women on the way from Koltubanka to Kermine; early February 1942 (the same image as MH 1856). Images 2141-2142 - Polish airmen in Teheran; 1 April 1942 (image 2142 is HU 69862). Image 2144 - General Władysław Anders and Archbishop Józef Gawlina saluting at the march past of airmen at Teheran; 1 April 1942. Images 2145-2146 - Lorries with Polish airmen on the way from Pahlevi to Teheran; 27 March 1942. Images 2151-2153 - Airmen of No. 1 Flight (Aerial Squadron) marching to the railway station; Teheran, 1 April 1942 (image 2153 is HU 69863). Images 2161-2163 - Archbishop Józef Gawlina amongst Polish Air Force officers; Teheran, 29 March 1942. Images 2164-2175 - Lorries with Polish airmen on the way from Pahlevi to Teheran; 27 March 1942. Image 2175 - Two unnamed Polish servicemen at their camp at Koltubanka; January 1942. Image 1011 - Field kitchen for evacuated servicemen from Soviet Union; Cowdenbeath, June 1942. Images 1014-1015 - Football team of eveacuted airmen during a game against local Scots (won 6:4); Kanderdine (? ), 27 August 1942. Image 1033 - Display of the exhibition or theatre play titled "We are coming to you, Our Motherland" Images 1034-1036 - Airmen exercising during a PT session at Cowdenbeath; August 1942. Images 1055-1065 - Airmen during a sightseeing trip to Dumfermline; August-September 1942. Image 1096 - Camp of the evacuted servicemen (from USSR) in Auchtertool; September 1942. Image 1104 - Two Polish servicemen in the ruins of St Andrews Cathedral; summer 1942. Image 1121 - Rifleman Księżycki on sentry duty outside General Sikorski's place of accommodation; Auchtertool; summer 1942. Images 1122-1135 - Rifleman Księżycki and his fellow serviceman on sentry duty outside General Sikorski's place of accommodation; Auchtertool; summer 1942. Images 1141-1144 - Scottish pipe band and Polish soldiers listening to it at Cowdenbeath; 24 August 1942. Image 1153 - Choir outside Polish Radio building; Edinburgh, 30 May 1942. Images 1191-1193 - Polish soldiers taking part in the 1st Mechanic Training Course; Ipswich, October 1942. Image 1222 - Polish church in London on Derrick Road (? ); unknown date. Images 1241-1243 - Canterbury Cathedral; April 1943. Images 1374-1686 - Sequence of seven images of the 1st Polish Armoured Division tanks in training at the Catterick Camp - Valentine, Sherman and Cromwell tanks; 1944. Images 3045-3052 - The Polish Hospital No. 1 at the Taymouth Castle at Aberfeldy; May 1944. Image 3066 - Exhibition titled "Poland" in the Catterick Camp; May 1944. Image 3086 - Bishop Thomas Shein of Middlesbrough visiting Polish Armoured Centre at the Catterick Camp; 21 may 1944. Image 3123 - Driving lesson for a Sherman tank in the Catterick Camp; March 1944. Images 3352-3381 - Images of the Catterick Camp - Humber armoured car; Churchill tank and Polish artillery unit; May 1942. Images 724-722 - Sequence of images of the 5th "Wilno" Infantry Division in Koltubanka; winter 1941/1942. Image 643 - Joyful Lieutenant Suzi of the Airmen and Sailors Company on his first day in Scotland; May 1942. Image 635 - Second Lieutenant Kristiani of the Airmen and Sailors Company on his first day in Scotland; May 1942. Image 484 - Lorries with Polish airmen on the way to Teheran from Pahlevi; March 1942. Image 2011 - Probably Second Lieutenant Leon Grzywna in one of the camps in Soviet Union; late 1941/early 1942. Image 1013 - Two members of the Polish Women's Auxiliary Service at Cowdenbeath; unknown date. Image 2022 - Officers of the 5th "Wilno" Infantry Division in Soviet Union. Left to right - 2nd Lt. Piotr Król, Lt. Birm (? ), 2nd Lt. Leon Grzywna; late 1941/early 1942. NEGATIVES Negatives are divided in five envelopes according to a level of their sychronisation with the prints. Envelope 1 Negatives divided in 11 plastic sheets with brief description of content and reference to specific prints in Print Albums 1 & 2 (on the right side of a sheet); and with reference to location in original negative album (on the left side of a sheet, if available). Envelope 2 Negatives of various training courses undertaken by Leon Grzywna while in service with the Polish air Force. They are not in order and no prints were identified to be from this pool of negatives. Training courses mentioned are as follows - Flying School in Hucknall, Notthinghamshire (01.10.1944-02.1945); Flying School in Broughton, Oxford (02.1945-06.06.1945); Flying School "Oxford" (28.07.-01.11.1945). Envelope 3 Negatives of various training courses undertaken by Leon Grzywna while in service with the 1st Polish Armoured Division. They are not in order and no prints were identified to be from this pool of negatives. Training courses mentioned are as follows - Ashford, Kent (01.01.-01.06.1943); Bovington (June-July 1943). Envelope 4 Negatives of General Sikorski' funeral (July 1943) and the 1st Polish Parachute Brigade. They are not in order and no prints were identified to be from this pool of negatives. Envelope 5 Negatives of Leon Grzywna's family and miscellaneous. The Second World War was the most destructive conflict in human history. 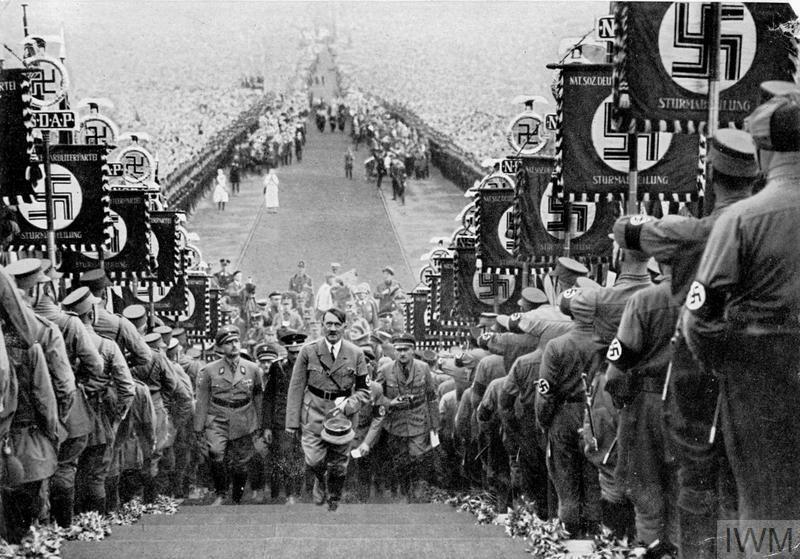 Years of international tension and aggressive expansion by Fascist Italy and Nazi Germany culminated in the German invasion of Poland on 1 September 1939. Britain and France declared war on Germany two days later. 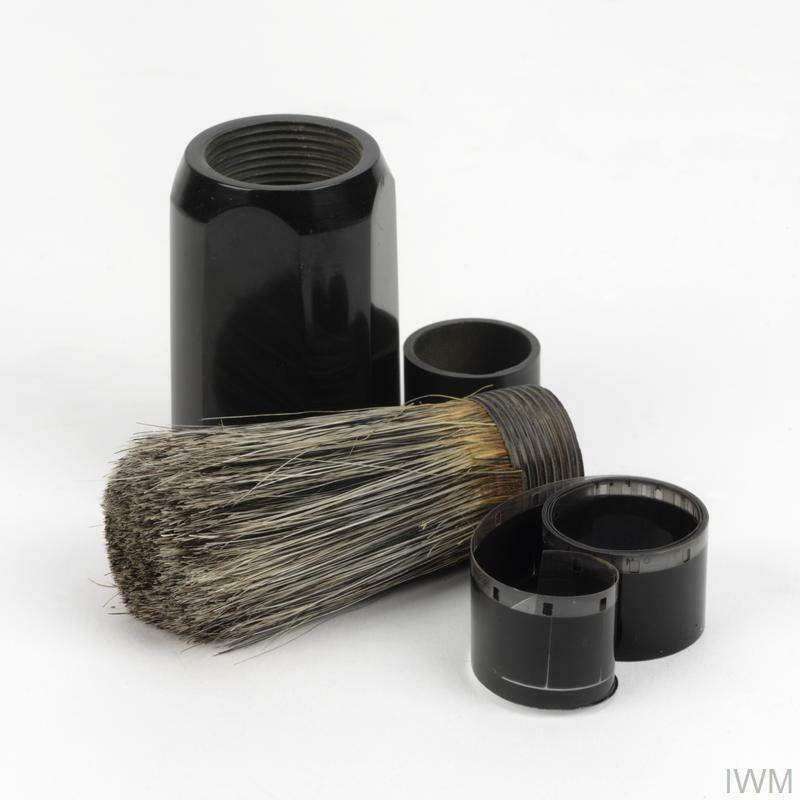 © IWM (EPH 10068) A standard male shaving brush with black, plastic handle and wooden base. One reel of miniature film can be contained within the 'hollowed-out' handle of the brush. Find out more about the agencies, military units and individuals who have fought the ‘Secret War’ – and how they address the threats of today.